Join Us as we celebrate YOU! Stop by and enjoy our many fun-filled stations. watermelon eating contests, games, raffles, a bubble-blowing station, a kids dance floor, and HOT DOGS! ALL FOR FREE! ALL FOR YOU!! Jamba Juice will also be joining us this year. They will be selling your favorite smoothies for a low price and a portion of the proceeds will be given to a non-profit organization here in Long Beach. 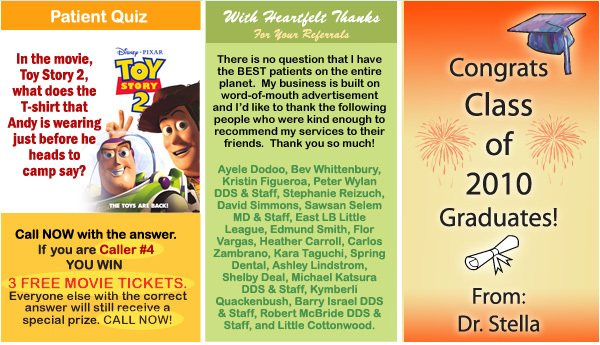 We love to give recognition to our new friends & our wonderful existing patients who are kind enough to refer their friends & relatives to us! 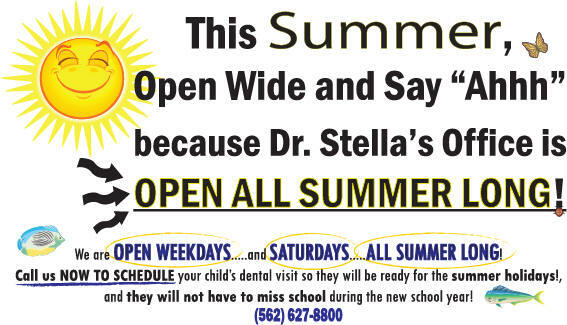 Here are the new patients that became members of our practice family this June. We’d like to welcome you & wish you all the best. Nathan Aguilar, April Andrade, Meledy Anguiano, Akiel Archer, Iris Burks, Kaden & Mackena Carrion, Olivia Carroll, Audrey & Leilani Choe, Brody Dahlquist, Grace Darby, Austin De Yager, Danielle Dobie, Grace Domingo, James Eskridge, Gemma Finazzo, Kayden Frazier, Armando & Damian & Syerra Garcia, Natalia Gomez, Rowan I. Graham-Jones, Brook Grant, Melissa Gutierrez, Maurice Harris, Klarisa Hernandez, Jacob & Joshua Hicks, Benjamin Hilleshiem, Andrew & Matthew Huezo, Sophia Hyde, Fischer Jackson, Marcus Jones, Daisy Juarez, Jace Klein, David Lainez, Kaylynn Long, Matthew Marrero, Nicole Martinez, Alexandra Mc Call, William Meldrum, Eloise Miller, Isaac Moreno, Anabel Ochoa, Isaiah Osorio, Deven Padgett, Christopher Pagan, Emilee Phin, Thomas Quinones, Efrain Ruiz, Casey Schafer, Sarahbbi, Prairie Stiwell, Finn & Malia Torres, Mia Y. Tsai, Victoria Valladares, Calaya Valrie, Noahlani Vargas, Ve Vazquez, Domonique & Tommy Jr. Waters, Max White, Nadia Yota, and Noah & Savannah Zambrano. . Many of you remember the trays with fluoride foam that we used to place in your child’s mouth for 1 minute (which for most patient seemed like the longest minute ever). Well you do not have to worry about that anymore. We have made a change that will benefit everyone. This new product contains sodium fluoride varnish, which has a higher concentration of fluoride than current gels, foams, rinses and pastes, but is less toxic to children because less of the product is swallowed during application. “Fluoride varnish quickly adheres to teeth and over time is slowly released to the tooth surface, promoting tooth remineralization,” said Dr. Jaana Autio, a UF College of Dentistry assistant professor of pediatric dentistry, who studied the effectiveness of one varnish in a group of Head Start children aged 3 to 5. Fluoride varnish comes in a small container and is painted on the teeth. 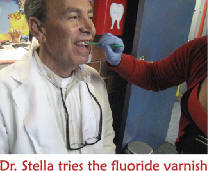 The yellowish tint of the varnish allows Dr. Stella to see where the product has been applied. Saliva enables it to adhere to teeth rapidly. Applying the varnish takes less than two minutes, making it ideal for patients who are anxious or who have special needs. The likable taste also is a drawing point but for parents and the dental professional the two main benefits are its effectiveness in preventing the need for fillings and crowns, as well as the decreased risk of fluoride toxicity and fluorosis. Root beer floats, anyone? Yum. Well we say, GO AHEAD! Exposing teeth to soft drinks, even for a short period of time, causes dental erosion, and prolonged exposure can lead to significant enamel loss. Root beer products, however, are non-carbonated and do not contain the acids that harm teeth, according to a study in the March 2007 issue of General Dentistry (peer-reviewed journal). That might be something to consider during the next visit to the grocery store. Consumers often consider soft drinks to be harmless, believing that the only concern is sugar content. Most choose to consume diet drinks to alleviate this concern. However, diet drinks contain phosphoric acid and/or citric acid and still cause dental erosion though considerably less than their sugared counterparts. Drinking any type of soft drink poses risk to the health of your teeth, says Dr. Stella. Dr. Stella recommends that patients consume fewer soft drinks by limiting their intake to meals. He also advises patients to drink with a straw, which will reduce soda’s contact with teeth. My patients are shocked to hear that many of the soft drinks they consume contain nine to twelve teaspoons of sugar and have an acidity that approaches the level of battery acid, Dr. Stella explains. For example, one type of cola ranked 2.39 on the acid scale, compared to battery acid which is 1.0.